This was a beautiful, large-scale pageant of boats and ceremonial tribal garments, as well as a touching ceremony. It was full of emotional pain and sadness, shockingly so. There are deep wounds in the First Nations consciousness. It’s easy to forget those in one’s everyday life. Many First Nations people attended this event, and it appeared to be very meaningful to them. I felt almost like an intruder, sketching the proceedings. But a couple of people said nice things to me about my drawing. At the end, as we cheered on the canoes paddling out of the ceremonial area, it felt to me like a bit of heaviness had lifted. 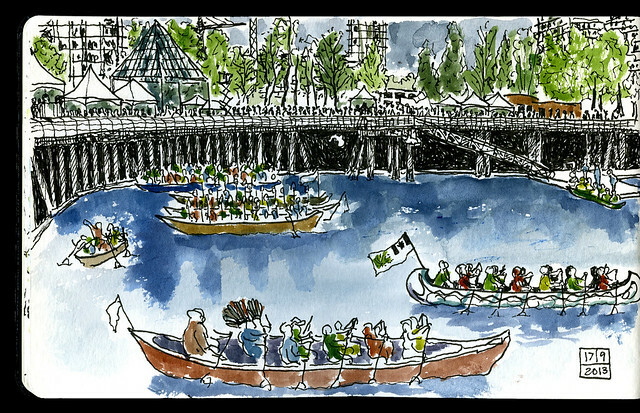 … Watch as beautiful cedar dugout canoes paddle into False Creek from Vanier Park to Science World and are welcomed in a traditional ceremony to the Coast Salish lands. … Indian residential school survivors will partake in the water that day and paddle up for protocol for recognition and honor. … The cultural significance of the canoe movement is the resurgence of songs, dances, names, language and teachings. … up to 110 canoes attend these cultural tribal journeys.